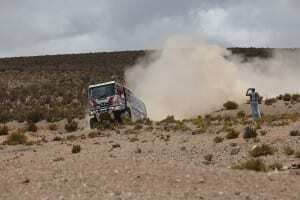 Hino, the leading Japanese truck manufacturer and the first one from that country to enter the gruelling Dakar Rally, way back in 1991, registered its 25th consecutive finish in the 2016 edition of this gruelling, annual cross-country race which ended in Rosario, Argentina, on January 16. The Hinos finished 13th (Teruhito Sugawara and Hiroyuki Sugiura) and 31st (Yoshimasa Sugawara and Takahashi Mitsugo) out of 41 trucks which completed the route of 9 217km. A total of 56 trucks had entered this year’s two-week-long event which started in Buenos Aires on January 3. This was the 25th time that Hino had participated in the annual Dakar rally-raid and Hino was once more the only Japanese truck manufacturer to tackle this epic event. The team also scored a 1-2 in the Dakar Challenge for trucks with engines of less than 10 litres capacity, making it seven consecutive class wins and the third year in a row with them being first and second in the class. This was the 16th time Hino has won this engine capacity award in the 17 times it has been contested since 1996. Hino, DAF, Kamaz, Scania, Liaz and Mercedes-Benz were the only six makes with a 100% finishing record in this year’s race out of a field that also included MAN, Iveco, Tatra, Ginaf, Renault and Maz trucks. This was the eighth time that the Dakar has been staged in South America after previously being run in Africa until it had to be cancelled in 2008 due to fear of terrorist attacks on the competitors. “We are pleased and proud at yet another display of outstanding reliability and durability by these two Hino trucks in the toughest regular test for this type of vehicle in open competition in the world,” commented the Vice President of Hino South Africa, Ernie Trautmann. “The two, four-wheel drive Hino 500-Series trucks entered by Hino Team Sugawara were once again the only representatives from the Japanese truck industry to participate in this two-week marathon across some of the world’s most desolate regions. The strong performance also served to underline Hino’s competitive spirit and technological resource,” he added. What makes the Dakar Rally a David and Goliath contest in the truck category is the fact that the Hino uses production-based six-cylinder intercooled turbocharged engines of less than 10-litres, while most of its rivals are in the “monster” category with much larger capacity engines developed specifically for this annual race. Both trucks were fitted with the Hino 9-litre common rail A09C-T1 turbo-intercooled engines which developed 630 horsepower and 2 255N.m of torque. The only problems encountered by the two trucks were some minor weld cracks which were easily repaired. This year’s route started in Buenos Aires, Argentina, and went into Bolivia before the finish in Rosario. It included 13 timed special stages, some of which were far longer than usual and there was a marathon stage over two days when no outside assistance in servicing the trucks was permitted. There was a significant amount of high altitude running, often above 3 000m, which was taxing on the crews and power sapping for the vehicles. This year Hino continued its long association with Team Sugawara, which is headed up by Yoshimasa Sugawara, who has entered the Dakar Rally 33 times consecutively – a record. He is the only Japanese to have competed in this epic race on a motorcycle and quad as well as in a car and truck. Now 73 years of age he holds the record for the most consecutive finishes in the Dakar Rally at 25. His son, Teruhito, contested the Dakar Rally for the 18th time in this year’s race and this was only the fifth time he has finished outside the top 10. Interestingly the second Dakar in which Hino participated finished in Cape Town after starting in Paris, with the Japanese trucks in 4th, 5th, 6th and 10th positions. The big breakthrough came in 1994 with a second position overall. This achievement was repeated in 1995, 1997, 1998, 2001 and 2005. The most successful year for Hino was 1997 when it became the first and until 2011 the only maker to take the first three places overall in the truck category when the route went from Dakar to Agades and back to Dakar.